Contrary to popular belief, the 1955 Chevrolet did not debut to throngs of excited customers, eager to plunk down $2300 for the totally new Bel Air with Chevy’s revolutionary V8 engine. Regardless of the show room hoopla that Chevrolet launched with the introduction of the 1955 models, they didn’t cascade out the door as quickly as Chevrolet would have hoped. Some inside GM feared Harley Earl had gone over the top with the ’55 Chevrolet, with its smooth flanks, high Cadillac-like green house and large, Ferrari-like grille. 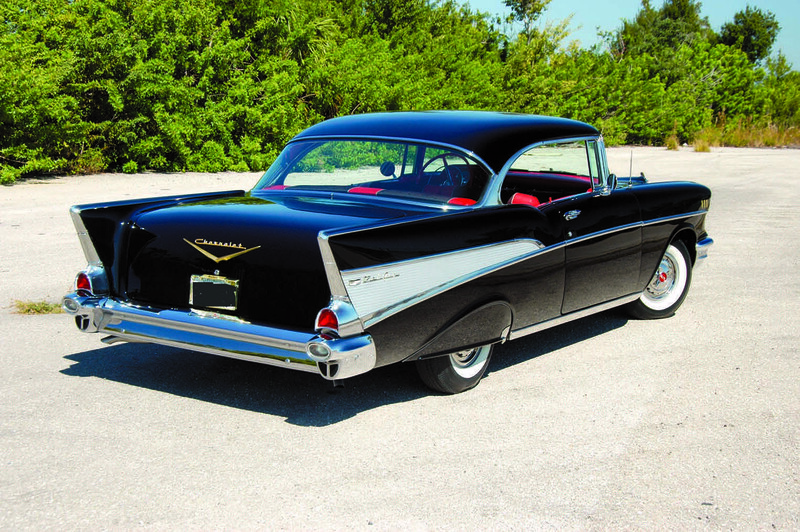 What Chevrolet marketers had failed to grasp was that 1955 was becoming the greatest sales year in history and with so many new models from the Big Three and the independents to chose from, buyers were taking their time making a selection. There was enough concern inside Chevrolet that a mid-year replacement grille was prepared. Sales began to accelerate, and by Christmas any thoughts of changing the front end vanished. 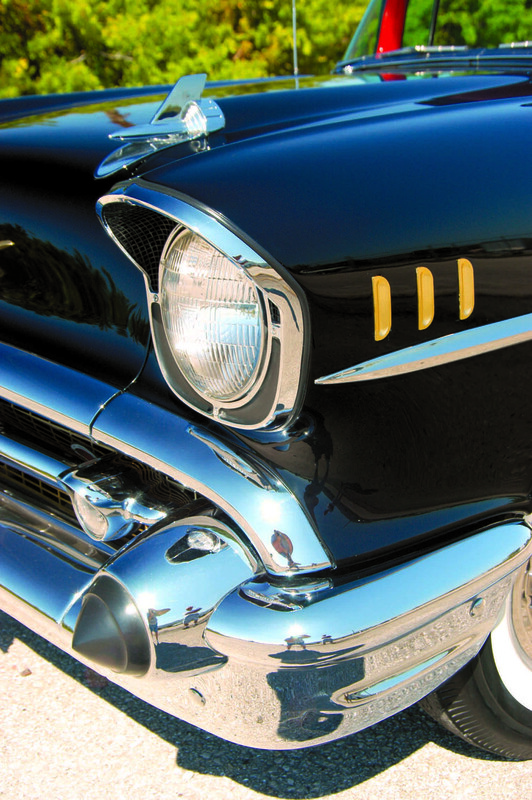 The grille was used on the 1956 models, along with new sheet metal that featured flowing wheel openings and the hint of a rear fin. 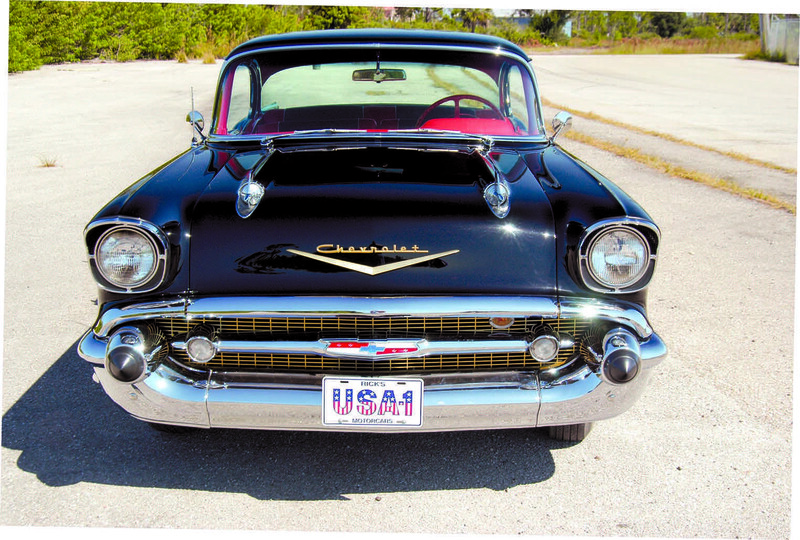 What should have been the new 1957 Chevrolet was delayed a year, so the 1956 models received a facelift, starting with an oval shaped grille with a single horizontal bar within that contained the parking lamps and the Chevrolet crest. The massive three-piece grille also contained a set of “Dagmars,” large round rubbed-capped bumper guards, ala Cadillac. A pair of windsplits ending in bright bombsight ornaments dressed the hood, and a sharp crease ran the length of the fender tops. The interior was all new, with a new sweeping instrument panel. 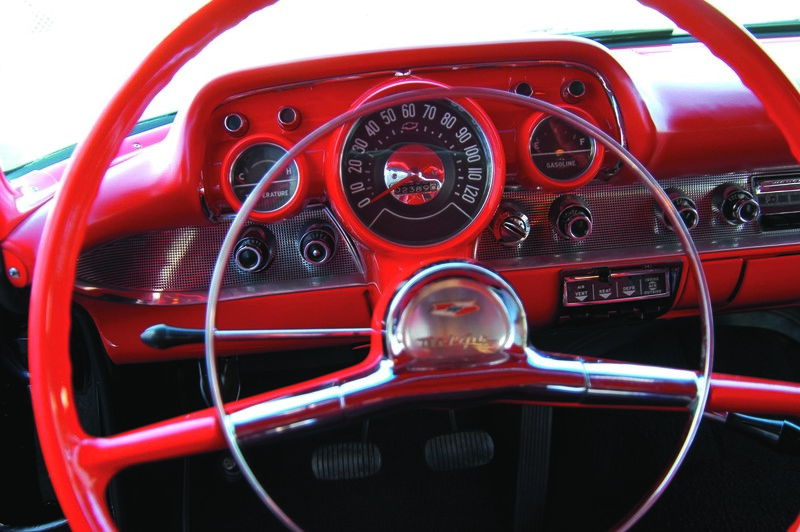 The instrument cluster was also new, with a large circular 120mph speedometer dominating the center of the panel. It was flanked by two smaller gauges for fuel and water temperature. Below the gauges was a long bright metal panel that contained the switches and controls. On the One-Fifty models, the interiors were spartan, with rubber floor coverings and cloth interiors. 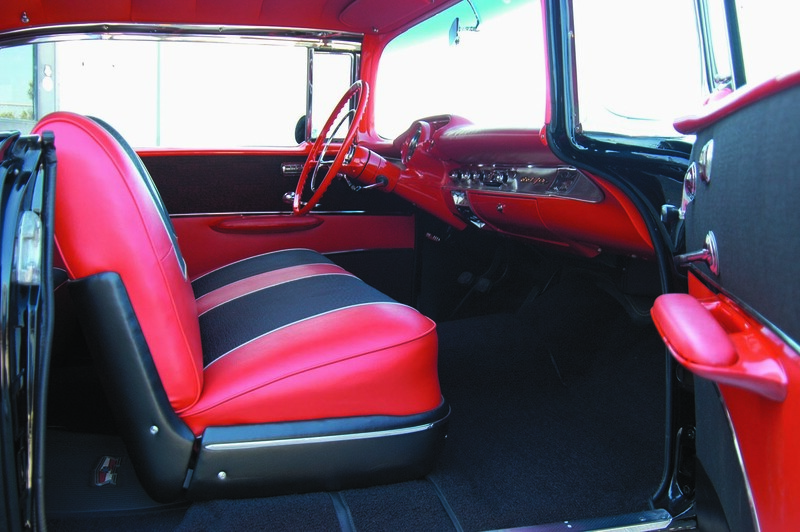 On the Two-Ten and Bel Air models, the interiors were plush, with cloth and leather grain vinyl seating surfaces available in single and two tone color combinations. Every luxury option was available, including power seats, power windows and air conditioning. The 115” wheelbase box girder frame (convertibles had a “X” center brace to add rigidity) provided 14 rubber bushed body mounts for hardtops and sedans models, and 20 for convertibles. The big 11 x 2” drum brakes were large and quite efficient and power assist was available. The front suspension was comprised of unequal length upper and lower control arms, tubular direct acting shocks, and coil springs. 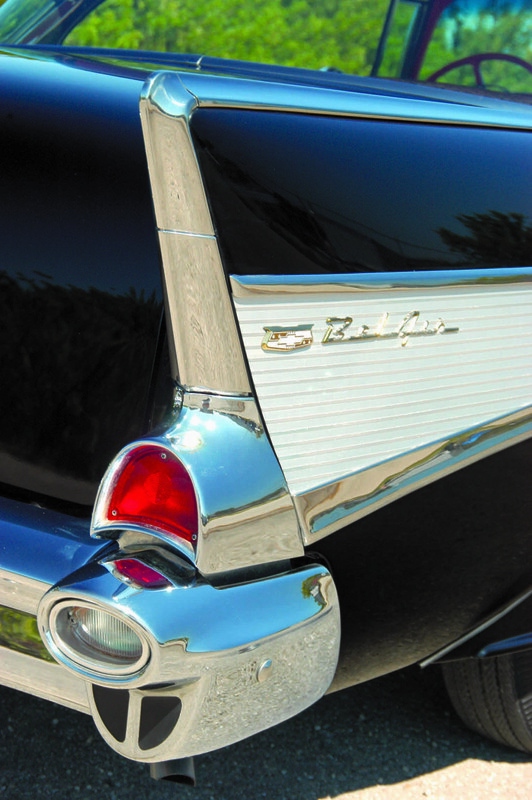 At the rear, the outrigger style semi-elliptical springs and direct acting shocks gave the ’57 Chevy a lower profile. The narrow 15” wheels were gone, replaced with wider 14x5J stamped steel wheels on 7.50x 14 tires. Depending on model, overall height varied from 58 to 60 inches. A total of eight engines were offered in 1957. The base engine was the tried and true Blue Flame Six, displacing 235 cubic inches and producing 140 horsepower @ 4200 rpm. After that, it was all about V8 power. While Ford may have enjoyed “V-8 leadership” for decades, Chevrolet’s extraordinary “big bore” engine had already established itself as the power plant of the future. Just one version of the 1955-56 265 cubic inch engine was carried over to 1957 – a two-barrel version rated at 162 horsepower @ 4400 rpm. From there on, it just got bigger and better. 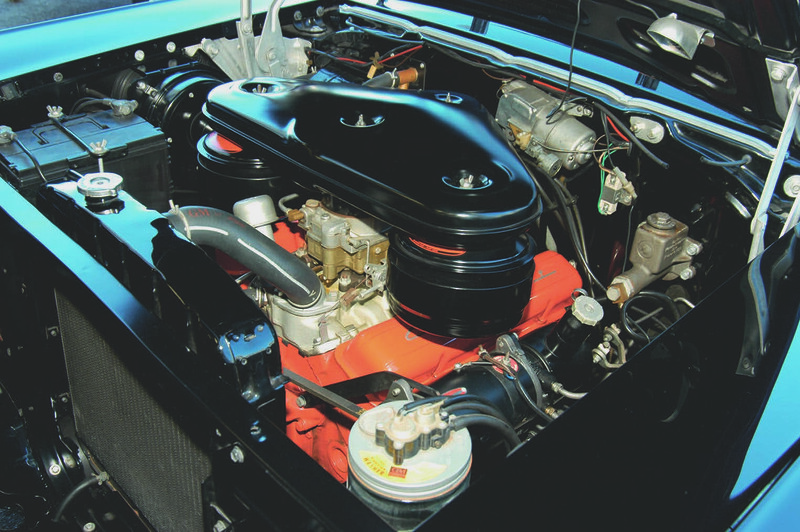 For 1957, the 265 cubic inch small block had grown to 283 cubes by opening the bore 0.11 inches. Six versions of the 283 were offered. A 185 horsepower @ 4600 rpm version with an 8.5 compression, two-barrel Rochester carburetor, and single exhaust served as the base Turbo-Fire V-8. Next step up was the Super Turbo-Fire V8, equipped with higher 9.5 compression heads, four-barrel Rochester carburetor, and dual exhausts. It turned out 220 horsepower @ 4800 rpm. The top four engines were right from the Corvette. Two had 9.5:1 compression, dual exhaust, hydraulic lifters, and dual four barrel Rochesters. The first was rated at 245 horsepower. The second dual quad engine and “competition” camshaft was pegged at 270 horsepower. 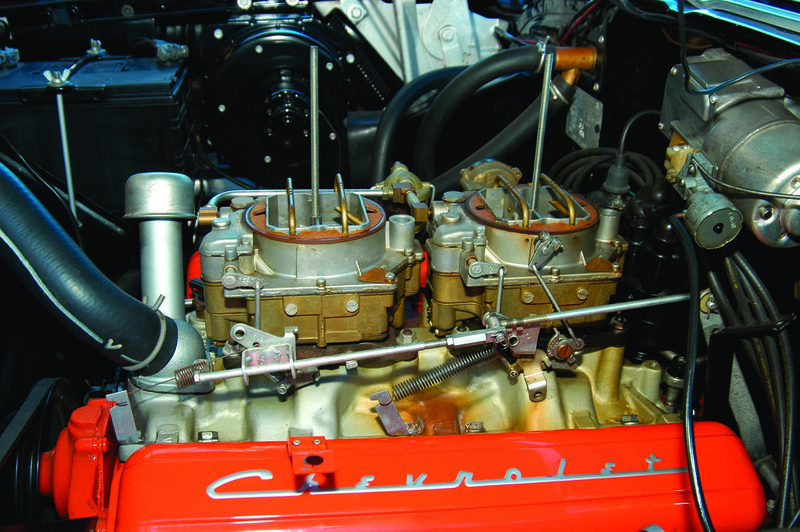 New for 1957 was the Rochester Ramjet mechanical fuel injection, offered in two versions. One had 9.5:1 compression and hydraulic lifters and was rated at 250 horsepower @ 5000 rpm. The top performance engine boasted solid lifters, competition camshaft, and 10.5:1 compression, good for 283 horsepower @ 6200 rpm. Chevrolet feted this engine as the first American V-8 to produce one horsepower per cubic inch. This wasn’t quite true, as Chrysler’s 1956 300B’s optional engine produced 355 horsepower from 354 cubic inches. Regardless, it was a sensation that a low priced car had an engine that powerful. A new automatic transmission, the Turboglide, was added to the option list, however its erratic performance discouraged buyers from specifying it. They instead preferred the two-speed Powerglide. Those preferring to shift for them selves, the three-speed Synchromesh was offered on the column. An overdrive was also offered for the three-speed stick. Rear axle ratios ran all the way to 4.11:1. 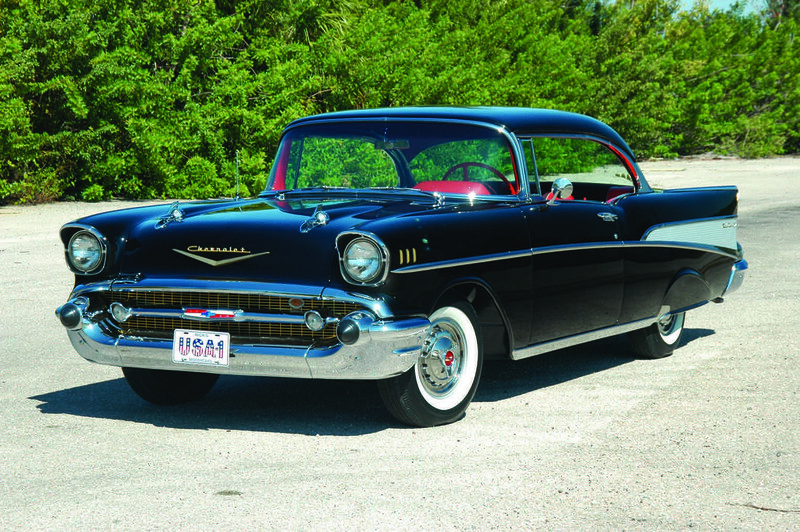 Even though the 1957 Chevrolet’s styling is now considered “post war classic” and is highly collectable, it couldn’t beat Ford in the show rooms that year. The Detroit arch rivals battled it out for sales supremacy the entire model year. When the final sales were tallied, Ford won the model year sales race against Chevrolet for the first time since 1935. In calendar year sales, Chevy beat Ford by the miniscule margin of just 136 units. In retrospect, both sides pointed to the numbers and spun them to their own advantage. It was the first time Chevrolet had used the “1 USA” plate in their advertising, a claim they’d continue to use for decades to come. The Onyx Black ’57 Bel Air featured here is owned by Rick Treworgy of Punta Gorda, Fla. Rick has owned the ’57 for 10 years. It’s one of the best restorations in the country, having scored a 997 at the Classic Chevy Club winter event in Florida. It features a two-tone Onyx Black and Matador Red interior with power windows and padded dash. Under the hood is the 270 horsepower version of the 283 with dual quads and high lift camshaft. It’s a superb example of what has become one of the most beloved collector cars of our generation.